The 9 Days Tanzania wildlife safari & Zanzibar beach vacation tour package takes you for a wildlife excursion to in Tanzania’s’ wildlife parks to enjoy an environment that has wild game. 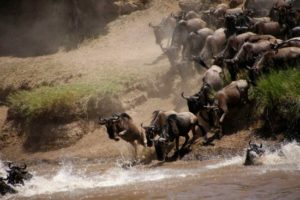 You will safari in Tanzania’s northern Tanzania game parks that includes destinations like Serengeti National Park that is famous for the wonderful wildebeest migration, visit the Ngorongoro conservation area that is home of to the Big 5 game. Before you drive to Arusha, you will also visit Lake Manyara park, Serengeti National Park and enjoy a Zanzibar Beach vacation trip before you return to Arusha where your safari ends. Your accommodation on this safari Tanzania is customized according to your choice. You may stay in lodges or book for you a camping package varying from luxury, mid-range and budget. Your drive guide will pick you up from your hotel in Arusha and set off for your 7 Days Tanzania wildlife safari in Lake Manyara National game park. you will arrive in the park in the afternoon, have lunch and proceed to the park for an afternoon game drive. The game drive will last about 2-3 hours inside the park, retire from the activity and drive to the lodging facility that was prior booked for your stay that night. Early in the morning after your breakfast at your lodging facility, you will do a morning game drive in the park as you drive out to the Ngorongoro crater where you will view for yourself this wonderful natural wonder of the world. While there, you will admire different wildlife that habits this park including..
On this day, you will have an early morning breakfast at your lodging facility, have your lunch packed and set off for your full day excursion down the crater with your guide in the Ngorongoro crater. You will have picnic lunch eave with picnic lunch for a full day exploration of the crater. After your day tour, you will transfer to Serengeti National Park where you will spend the night. Early in the morning after an breakfast at the lodge or your area of stay, you will drive to Serengeti National Park passing through Olduvai Gorge the archeological site of the Leakey family for a cultural safari. After breakfast, you will do a morning and afternoon game drive I the park so you can explore the Serengeti plains all day. Retire from the park, freshen up, dine and rest. Early in the morning after breakfast in Serengeti, you and your driver guide will drive through Serengeti National Park for a morning game drive as you see more wildlife that habits this park. Have lunch and drive to the Serener Airstrip for your flight to Zanzibar. Arrive at the strip, drive to your hotel, check in, dine and rest. After your breakfast at the lodge, your guide will pick you up at the lodge and transfer you to Magical beach of Nungwi (North Coast) where the Swahili culture was born. it is the most ideal place to feel the atmosphere, and soul of Zanzibar. Visit the Elegant trader’s houses, old coral stone buildings set behind large carved doors, some with Koranic inscriptions in Arabic, narrow alleyways with covered balconies, wonderful shops and tiny stalls, spice and fish market, and in the evening, you will hear sounds and smells from the Fordham Gardens where fish and lobster are grilled on barbecues. Zanzibar is known as the Spice Islands. A guided tour to spice farms and plantations is an option here. Zanzibar is an idyllic beach holiday island, sandy white beaches and clear blue waters are among the best in the world. Your guide will take you to the hotel where you will spend the night. Overnight at The Z Boutique Hotel. After breakfast at the hotel, you will enjoy a full day at leisure where you will choose on places to visit. You can visit the historical Stone Town, Spice tour, Prison Island, Safari Blue, sandbank picnic and many more. Being known as the Spice Islands a guided tour to spice farms and plantations is an option here. While there, you can see, smell and taste aromatic species, scented plants among them, guava, mangoes, vanilla, cloves, nutmeg, ginger, chilies, black pepper and cinnamon. 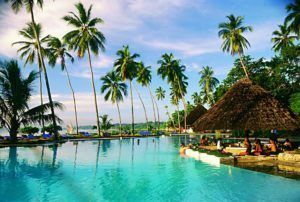 Zanzibar is an idyllic beach holiday island, its pristine reefs, sandy white beaches and clear blue waters are among the best in the world. Overnight at The Z Boutique Hotel. Wake up to a relaxed breakfast at the hotel and transfer back to Arusha where you will catch your flight back home.